It was lunchtime on a sunny Saturday and we were looking for a great place to have lunch, but with a view. The place ...Backwater Bar & Grille ...the view Queechy Lake in Canaan, NY, a short, 10 minute ride from Pittsfield. We've been a fan of the Backwater for several years, and always enjoy our visit. With a friendly staff, great food and situated right on the lake, who wouldn't want to return. They offer a nice selection of specials and on that day, I opted for the French Dip while Cindy went for the Open Tuna Melt. Let's face it, the Au Jus plays a big part in a great French Dip and their Au Jus is outstanding! To finish it off, it was oven baked to perfection and served with a nice portion of crisp, golden fries. 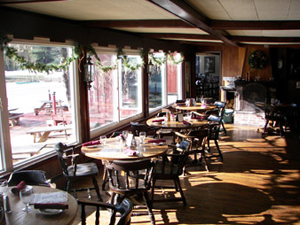 Dining at the Backwater Bar & Grille is casual and always a pleasure, whether you choose to sit in the Tavern, which offers table as well as bar seating, outside in the warmer month (real lakeside dining at it's best) or inside in the dining room over looking Queechy Lake. In the winter months enjoy a romantic dinner in front of a crackling fire in the old stone fireplace. The Backwater has some great history and it's elegant, yet rustic decor will add charm to your visit. Over the years we have enjoyed many of the delicious items on their menu, including the New England Clam Chowder, which is thick, creamy and loaded with tender clams and their French Onion Soup which is also fantastic. If you're looking for a fresh burger, they serve an 8 oz. handmade Angus burger, which is delicious and served on a Kaiser Roll. They offer a nice variety of burger toppings, though I've come to like the bleu cheese and bacon, but get creative and go for it! The Chicken Parmesan, Chicken & Broccoli Alfredo, Baked Stuffed Haddock, Hand Cut Sirloin Steak ...just to mention a few are all excellent. Take the short ride and put the Backwater Bar & Grille on your list of places to try!